Social media has changed our society and the way we communicate fundamentally. On a personal level, it helps people stay connected to friends and family around the world. On a professional level, it has had a big impact on how we do business nowadays. June 30 is National Social Media Day – though let’s be honest, for most people every day is social media day. The fact that this day exists, even only as an unofficial holiday, shows how important social networks such as Facebook, Twitter, Instagram etc. have become in our daily lives. People don’t just use it for connecting with their social circles or instagramming a photo of their lunch, but social media has become much more. It has become an extension of our real lives, a news source and an outlet where everybody has the chance to voice their opinions on all kinds of topics and issues. For many people social media has replaced the mainstream media as their go-to source of information. For businesses, it is also essential to have a social media presence. Social media marketing has become an important device to gain organic leads and attract customers. The biggest advantage social networks offer is that companies and organizations can reach people all over the world and thus, are not limited to a geographically close target group anymore. Of course, traditional marketing (billboards, TV ads etc.) and networking (congresses, career fairs etc.) is still relevant, but it’s undeniable that social media is now an established method to build a brand and reach current and potential customers. 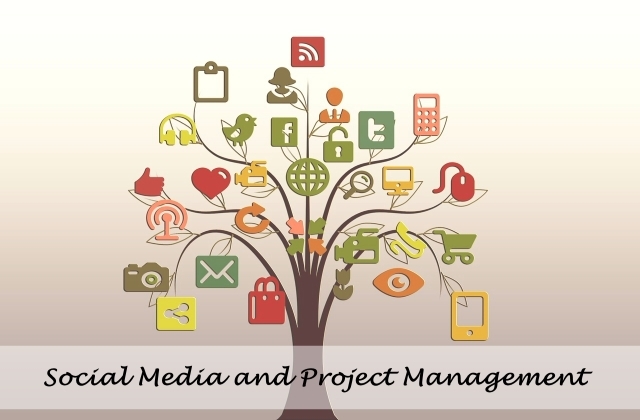 Project management can also benefit immensely from social media. Here are the top 5 advantages of social media that can lead to project success. A successful project manager is one who has exceptional communication skills. Of course, you also need to have the necessary hard skills to execute a project successfully, but that’s only one side of the coin. A big part of a project manager’s job is to communicate with team members, executives and other important stakeholders of a project. As a project manager, you can use social media to give your team members and customers real time status updates. ‘Live feeds’ of the project’s progress will keep your project team not only informed, but also give them a sense of achievement, because they can immediately see when they have reached important milestones. Another advantage is that you can address issues and problems instantly. In a world that is connected 24/7, customers expect you to react as soon as possible – preferably immediately. A quick response can – in extreme cases – decide the fate of a project. Project teams no longer have to work in the same location. Nowadays many project teams are geographically dispersed. This and other related issues, such as time differences, pose a challenge for effective collaboration, which is important for innovation and problem solving. However, services such as Skype and other video platforms have become great ways to collaborate with team members in other countries (key word: virtual meetings). If there is a time difference, you could record the meeting and share it via a video platform like YouTube or Vimeo. Your remote or dispersed team members can directly comment on or give feedback to the video. Another way to collaborate is instant messaging. You can interact in real time with others and this offers possibilities of problem solving on the spot, instead of waiting until there is a scheduled meeting for it. Effective collaboration can lead to more engagement and team members and stakeholders will feel more committed to the project, which can aid its successful implementation. The most fundamental feature of social media is that it enables people to connect with others and to create a network. We all have our personal social networks of friends and family, but it’s much harder to connect with – or rather stay connect with – people on a professional level. Facebook or LinkedIn groups created by and for project managers can help you connect with others in the same field and facilitate the exchange of information and knowledge. On Twitter, you can communicate with other project managers via the hashtags #pmot (project managers of twitter) or #pmp (project management professionals). Working from 9 to 5, Monday to Friday, is not the norm anymore. People want more flexibility and freedom to structure their work individually. Social media has given people this freedom. They don’t need to be physically present to get the information they need and others can reach them wherever and whenever they need to. This of course, is time and cost effective. There are some meetings (e.g. daily updates) that not everybody has to attend physically, so those that are in distant locations do not have to make a long journey. That way, they can save valuable time which they can use more productively. The best thing that can happen to a business is a marketing campaign gone viral, it’s basically like hitting the jackpot in the lottery. But even if your campaign doesn’t go viral, it’s worth to promote your project on social media. It’s not just a means to get customers to notice your project or to get their feedback, but it can also show executives that there is interest for it, which is important to get their buy-in. Social Media and Project Management - InLoox • Copyright 1999-2019 © InLoox, Inc. All rights reserved.